Looking for Tulsa Window Cleaners? Choosing the right window cleaner. In this article we are going to be discussing how you can go about choosing the right window cleaner. Tulsa window cleaners and window cleaners and general typically claim to be the best choice for your money. Furthermore, they literally think that that statement is true. So as a consumer, it makes choosing the right company hard. Due to all the confusion, there are a number of factors you need to weigh out. The first place you might want to start it’s getting window cleaning estimates from the companies in town. The process of getting estimates from Tulsa window cleaners can take quite a bit of time. However, if the window cleaning company cares about your time, they will have an instant estimate feature on their website. Therefore, you will be able to get a window cleaning estimate at your leisure. Since the window cleaner doesn’t need to drive to your house, you don’t have to schedule a time to get the estimate. Most noteworthy, you can even get a window cleaning estimate in your pajamas while laying in bed. Offering instant estimates on their website is a great way for you to distinguish the pros from the new guys. Distinguishing factors between window cleaning companies. After you have received window cleaning estimates from all the companies you’re interested in, it’s time to compare the companies. Some factors to consider might be the following. 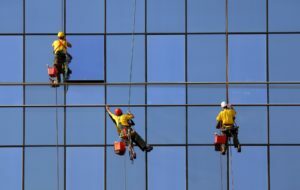 What is the reputation in the Tulsa window cleaning Market? Do they have insurance? Do they offer any guarantees? Especially relevant, how many five star reviews do they have? We will be going over all of these factors. Reputation in Tulsa window cleaning market. Probably the most noteworthy factor to consider is their reputation. An easy way to find out a company’s reputation is to do a quick Google search for their company. As a result, you will be able to see every review the company has received through Google. This will tell you whether or not other homeowners in Tulsa have had a good experience with the company in question. Don’t forget to compare how many reviews each company has with each other. Because the company with the most reviews is typically your best choice. If they have very few 5 Star reviews, they might not be a good company. In addition, another factor to consider is safety. Insurance and safety go hand-in-hand, however we will talk about insurance later. Many window cleaning companies use ladders. You might want to hire a company that doesn’t use letters though. Because hiring a company that uses a water fed Pole means that they will be much safer. There’s no risk of falling off a ladder if they are never on the letter in the first place. Furthermore, by using a water fed Pole, the company is less likely to damage your property. Window cleaning accreditations isn’t really an important factor. First of all, the window cleaning company simply paid for the accreditation. They didn’t earn it. Window cleaning companies we’ll use these accreditations to make it seem like they’re more professional. Since they just paid money to have the logos for these accreditations on their website, they aren’t real. In addition, there’s a good chance that they might have stolen the accreditations and just put them on their website. Doing so is as easy as copy and pasting an image on your website. It’s deceitful, but Company still do it. Choosing an Insured Window Cleaning Company. Choosing and insured tulsa window cleaning company is your best bet. We would recommend hiring a company with at least a million dollars and liability insurance. 1 million dollars is actually the minimum amount of coverage a window cleaning company can get. This liability insurance will cover anything that gets damaged except the windows while they are cleaning your windows. Furthermore, we would recommend hiring a company that has insurance through Joseph D Walters. Because Joseph Walters insurance covers the windows too. While insurance is good, it’s best to have insurance for the windows themselves. Let’s talk window cleaning guarantees. Make sure you know what they guarantee. Do they offer a Rain guarantee? Do they offer a streak free guarantee? Because if they don’t, I wouldn’t hire them. Rather, you should hire the company with the guarantees. Consequently, hiring a company without guarantees could be bad. If you get the windows cleaned and it rains, what then? You are left with dirty windows. However, if the company offers a rain guarantee, no more problems. As for the street free guarantee, make sure they have it. Nobody wants streaks on their windows. Here at gleaming glass, we offer a streak free guarantee. If your windows have streaks, we will come back and clean them for free. The best price for window cleaning. Probably the most important deciding factor is price. First of all, I should mention price shouldn’t be important. The cheapest company is not the best company. Therefore, price is not something to rely on when deciding. In addition, you might not want to pick the most expensive company. It’s best to pick a medium to high price company with good reviews. Most noteworthy, a great reputation. Nobody wants to make a for choice. By choosing the wrong window cleaning company, you lose. Most of all, you will lose money and time. If the company you choose is not good, you lose money. Furthermore, you will also lose time. You might need to call them back to re-clean the windows. Choosing the wrong Tulsa window cleaners will cost you greatly. However, using the right window cleaning company will be great. Let’s talk about how to make the right choice. Finally, it’s time to make the right choice. It’s time to choose the right Tulsa window cleaners. You need to consider everything we have talked about in this article. Make sure they have a great reputation. Verify that they have insurance. Read all the reviews. Save time by getting instant estimates from companies that offer it. If you take all of these things into consideration, you will make the right choice. As a result, your money will be well spent. Most noteworthy, you will have clean windows. In addition, your neighbors will be jealous. The choice is clear. Take all of these factors into consideration. Finally, inspect every window cleaning company in Tulsa. Compare and contrast their reviews. Will they offer a rain guarantee movie? How about streak free guarantees? Do they have liability insurance? Gleaming glass is the correct answer to all of these questions. The right choice is clearly gleaming glass!